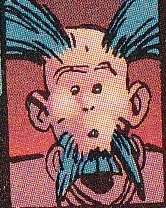 Other Distinguishing Features: Misfit has hair and a beard that both stick out. Misfit was one of many Vicious Circle members that emerged during the Gang War, spending the entire conflict inside the Freak Outpost bar. Misfit is murdered by Dart II during her raid on a VC warehouse.